As promised, here is the setup of the 6-screw pivot bridge on a vintage, MIM or Squier Strat. 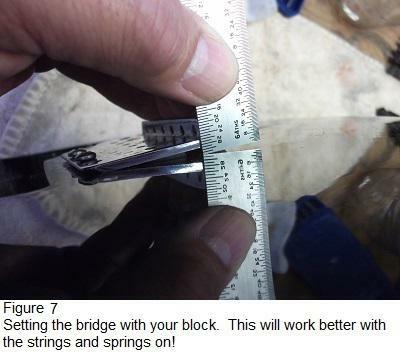 I’m also going to detail a modification that will make your bridge pivot better and return to pitch more accurately. Read through this post before you take your guitar apart. You’ll need your guitar for reference. 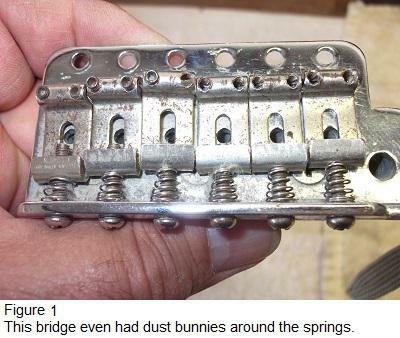 This poor ’80s Strat bridge was scratched, rusty, dusty and corroded… a real mess – perfect for this project! Shame on you if the bridge on your guitar looks like this! 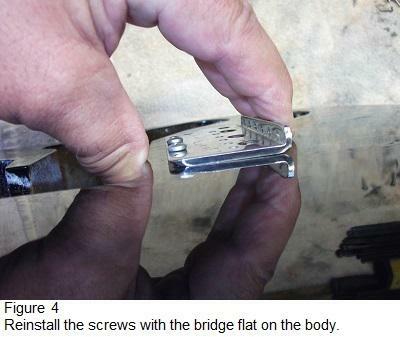 WARNING: Modifying a vintage Strat bridge may be hazardous to the value of your Strat! Also, I know this mod works but there is always a risk it won’t meet your expectations if you do it. Go to your guitar guy and get a junky old bridge and work on it. Then, you can always restore your original bridge if you don’t like the result. The setup is Fender’s, with a couple tips to make it easier, thrown in. Figures 2 & 3 illustrate what we are going to do. Let me tell you why, first. Activate the trem on your guitar and watch the bridge plate pivot. The plate is pivoting on the top rear of the mounting/pivot holes, a “knife-edge”, if you will, formed by the edge of the plate and the screw shank. The modification changes the location of the knife-edge to the bottom of the hole. (Almost… the bottom of the holes are already beveled to provide clearance so we are moving the pivot point down as far as we can.) A lower pivot point provides a more natural action to the trem. So, check out figure 2. I’m using a jeweler’s round file to bevel the back edge of the mounting/pivot hole. 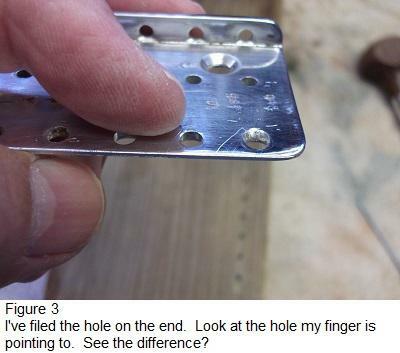 You’re going to file it until you get a knife edge as in the last hole in figure 3. Don’t go too far! Check your progress often, until you just bring the bottom side of the hole to a sharp edge. You want to angle the bevel about 30 degrees. You don’t need any more than that. Make all the holes as close to the same as you can. Now I’m going to give you a universal setup for the bridge, modified or not. If you’re setting your bridge flat to the body but still want the trem to work, this setup will work for you, too. Mounting the bridge will be easier if you install just the sustain block before mounting. The saddles can be mounted afterwards. 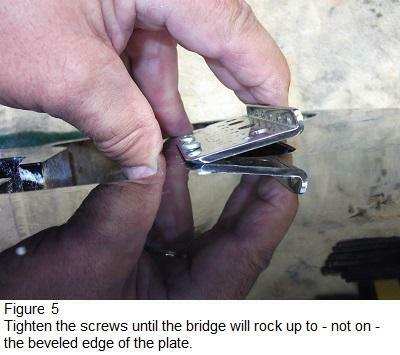 Put your bridge in position and install the six pivot screws loosely (figure 4). Rock your bridge up to the point you normally use the trem. 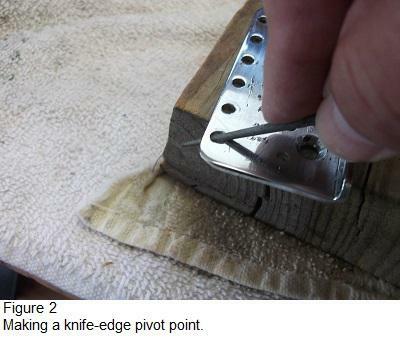 (Figure 5) Right on the edge of the bevel is optimum. Tighten the 2 outside screws down so the edge of a guitar string envelope just slides in and out without snagging. 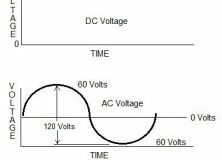 (See figure 6.) Once you’re happy with the movement of the trem, bring the other screws down and set them the same way. 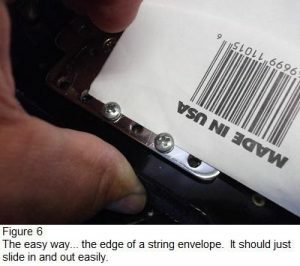 Tip: cut the end 3/16″ of a string envelope off so you have 2 layers of paper and slide it in under the back side of the screws. When you have that done, the paper should just slide from side to side without binding on the screw heads. Go ahead and install the saddles and then the strings and springs, using your trem shim from Issues 9 & 10 to set the 3/32″ float or tighten up the springs until you can hold the bridge flat to the body against the string tension. A word about the shim: If you have the big sustain block on your Strat, the shim I show in Issue 9 is too big. The Amer. Stand. 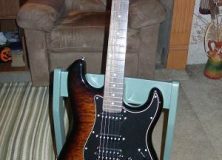 Strat has a thinner sustain block so there is more room in the rout. 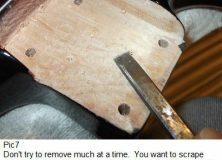 You’ll need to modify the taper of the shim to start at 7/16″ at the top and run down to 1/4″ at the bottom. Set your saddles a little high and follow the instructions I gave you for all the setup measurements in Numbers 10 and 11. All the Strats that use a 6-screw pivot tremolo are designed to float 3/32″ off the body at the back of the bridge. I measure right where the plate turns flat from the rear curve, as shown in figure 7. The bridge position shown is where your bridge should sit when the strings and springs are balanced. You see that some of your tremolo travel is gone when in this position. This style of bridge is not made for “dive bombing”. 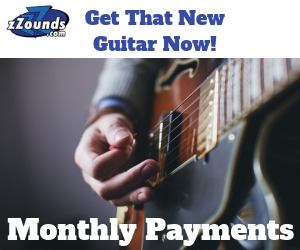 If that is what you want to do, buy a Jackson with a Floyd and do your best EVH imitation. The Fender Strat Tremolo isn’t designed to even rock up onto the bevel at the front of the plate. The bevel is there to allow the plate to pivot up farther than it would if the bevel wasn’t there. If you want to set the bridge flat to the body, don’t file it! You will need longer saddle height screws as the saddles will be higher, but the trem will work fine flat. You will need a minimum of 3 springs to hold it there, depending on what gauge strings you use, which will stiffen the feel of the trem but, if you break strings often, the guitar won’t drop to the key of X when you break a string with this setup. You do not have any “up” pull, though. The word is that Eric Clapton preferred this setup on Strats, and also added a wooden block between the sustain block and the body to further increase the tonal transfer… but that makes the guitar a hard tail. The choice is yours. If you rarely use your trem, you might try setting it flat with a fairly stiff arm. Once you’ve gone through the set-up sequence, you can fine-tune the trem. If it works smoothly (it should be better than before) and you’re happy with it, leave it alone. If it still doesn’t move quite right, or it tends to bind, you probably didn’t get all the holes beveled exactly the same (pretty hard to do without some kind of jig) so one screw is binding. Yup… you need to take it apart and check that out. (Try these other things first.) Did you oil the pivot points with 3-in-1 (or similar) oil? Is your claw straight, or do you have more tension on one side than the other? Those are the most common mistakes. Still no luck? Give each of the pivot screws a quarter turn out (CCW). If that doesn’t help, try another quarter turn. If you still aren’t happy, I’m not sure what to tell you as I haven’t experienced that problem. Put your original plate back on, I guess. Give yourself a chance to get used to the feel before you cuss me out and redo everything. The trem may feel slightly different than your pre-modified trem. Until next time (Tele’s)… See you in the G-M Forum.